The number of mortgages lent to house buyers fell last year to its lowest level since 1974, the Council of Mortgage Lenders (CML) has said. There were just 516,000 mortgages granted to house buyers, down 49% from the level seen in 2007. I’ll spare you the rest. But essentially, these numbers are meaningless unless we can see the time series data. And rather than being presented in hundreds of words of text, that time series needs to be presented in a graphic. I have no idea how significant this number is. I have no idea what the levels in 2006 were. 2007 was, after all the start of the credit crunch. To understand what is going on, I now have to do multitudes of Google searches to find out mortgage approval levels in 2006, 2005 and 2004. Despite those being salient facts to help me assess what is going on, the BBC hasn’t provided them. The right way to handle this would be for the BBC to put some graphics–which tell a bigger story–and might explain what is going on. The underlying data could be linked to in a service like EditGrid or Google Docs, people like Silicon Alley Insider get this. 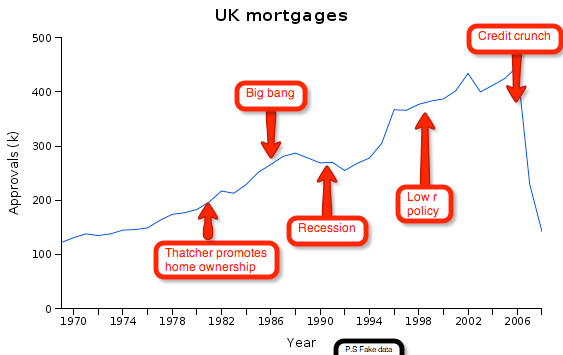 To be fair, the BBC does sometimes provide graphics–like this one on the level of mortgage rates. But at the same time that story is full of data points with no context or anchor–making them superfluous or immune to analysis. We are at an unprecedented time, when all of us need to take personal responsibility for our understanding of the economic decisions we take. We can’t simply let ‘experts’ run them and hope for the best while the credit is cheap. So long as financial reporting verges on innumerate, that job will remain harder than ever. P.S. Apologies to the BBC journalist concerned (although it is unlikely you are one of the four people who will read this blog). I don’t mean to pick on you, but it is crap that you didn’t even include a table of data for us to figure out what was going on. This entry was written by Azeem, posted on February 12, 2009 at 12:26 pm, filed under Uncategorized. Bookmark the permalink. Follow any comments here with the RSS feed for this post. Post a comment or leave a trackback: Trackback URL.